The sounds of flowing water, wind blowing through the pines and morning song birds offer a calming and natural environment for a stressed-out soul. To utilize the wilderness’ self-rejuvenating effects, Holiday Expeditions began offering women-only river retreats in 1980. The growing trend in women-only travel and the popularity of Holiday’s women-only initial trip offerings has expanded the program to encompass a variety of settings, all with the elemental concept of healing and refreshing women’s minds, bodies and spirits. Floating down the lower section of Idaho’s spectacular Salmon River or Utah’s awesome San Juan, Green, Yampa or Colorado Rivers, through breathtaking canyons, the popular trips help women learn relaxation and stress reduction techniques while enjoying the rivers’ natural beauty and thrilling rapids. 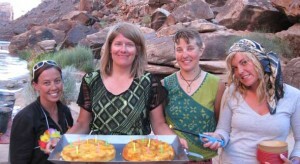 Women may also choose seven-day river trip ranch and raft trip to enjoy extra days for themselves. The idea for the women’s trips came in 1980 when Deanna English, one of the women’s trip facilitators, got a group of girlfriends together for a river trip. A registered nurse and massage therapist, English now facilitates the trips throughout the summer for women looking for a relaxing vacation alternative. English notes that four days is just long enough for women to get away from work and families to pamper and enjoy themselves. The rivers’ pristine beaches and banks not only provide some of the best campsites in the West but also offer an ideal platform for morning group meditation and yoga with certified yoga and meditation instructors, who also facilitate the trips. After a rewarding Holiday-style breakfast, prepared by women river guides, the groups takes to the rafts for a day on the river. Class II and III rapids draw women together to face the unbridled challenge of the river. On calmer water, guests can test their skills on the rivers’ ripples and eddies in inflatable kayaks or talk with the trip leaders about particular stress-reduction or massage techniques. Stops along the river during the day for lunch, playing and exploring also add variety to the day’s activities. In the evening, while guides create tantalizing appetizers and delicious dinners, English takes time to work with each guest, using reiki, reflexology and pressure point techniques to target tight or damaged muscle tissue. Other guests might pair-up to share head and neck massages. By the end of the retreat, guest not only have found an inner unity, they have also discovered strength within a group that most women have never felt before. The last night on the river, guides and guests share special gifts, memories or keepsakes, acquired along the river – special mementos that remind each person of the experience.